Severe weather moved across the Alabama, Louisiana, Mississippi Division Tuesday afternoon into early Wednesday morning and brought heavy rain, high winds and several tornados with it. The Salvation Army responded to the Sugar Hill RV Park in Convent, Louisiana which saw the worst of the devastation. 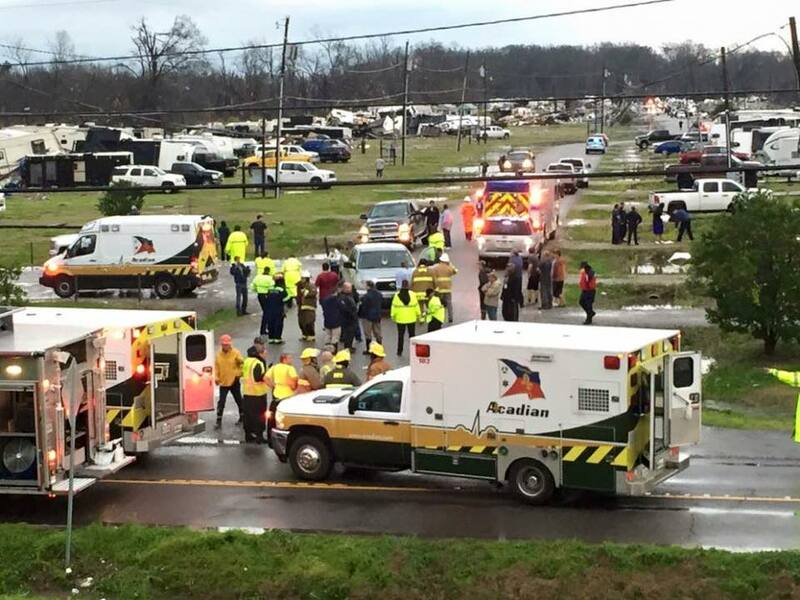 The Baton Rouge Corps and New Orleans Command both responded with canteens and volunteers to serve first responders and residents whose vehicles were literally turned upside down from the high winds brought by the storms. “A great team of people headed straight to Convent once we learned of the need last night. This is difficult work for the first responders, and we are just glad to be able to serve and help them do what they have to do”, said Captain Brett Meredith Baton Rouge Corps officer. Between the Baton Rouge Corps and the New Orleans Command, over 200 meals were served, 400 drinks and snacks, and twenty pairs of socks and six pairs of gloves were handed out. Plus, officers on site provided spiritual care to those who requested our help. Local officials have confirmed two deaths and 30 injuries from this location. “Our hearts go out to those who lost loved ones last night, and we pray that our work may ease the burden that everyone feels during times like these”, shared Captain Meredith. In Mobile, Alabama, the Coastal Alabama Command activated their emergency shelter due to severe weather pass through the area. The Salvation Army housed 49 total overnight and served breakfast. Financial donations are the best way to support those affected by these devastating tornadoes. Donations can be made online at www.disaster.salvationarmyusa.org, by calling 800-SAL-ARMY or by sending a check to your local Salvation Army, earmarked, Emergency Disaster Services. While used clothing and used furniture are seldom required during disaster response, these gifts are vitally important in supporting the day-to-day work of The Salvation Army. Please consider giving these items to the local Family Store by dialing 1-800-SA-TRUCK (1-800-728-7825). For the latest emergency disaster services news from The Salvation Army, please visit www.disaster.salvationarmyusa.org or follow the social feed on Twitter at @salarmyeds.